"Before I begin, you have to understand something. What must be understood is that his evil was as apparent to me as his yearning to be angelic." There is a difference between excuse and explanation. No one knows this better than Catherine Sellers as she recounts the story of her relationship with Thomas Christie to their child. 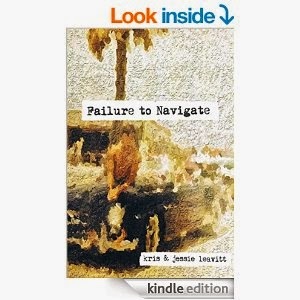 Failure to Navigate is a fictitious re-telling of a true story inspired by personal letters, authentic medical documents, and verbal accounts from those who have survived. With the late1960s and early 1970s as a backdrop, Catherine and Thomas's romance begins in a whirlwind of underground parties, fast cars, and drug-fueled nights. Things turn dark as Thomas sinks deeper and deeper into his mental illness and Catherine tries to navigate the emotion and violence that comes with it. The pendulous back-and-forth nature of their relationship is as extreme as the thoughts in Thomas's mind, swinging between the sweetest, tenderest moments of young love to the erratic brutality of abuse. Though he yearns to be “a good, good man,” Thomas's attempts at redemption are no match for the depth of his sins. Review: This is a powerful book about first love gone bad. Catherine is young and ready to fall in love when she meets Thomas, a wealthy, charismatic boy with a troubled past and destructive behavior. She falls like most of us did when we were teenagers-full speed ahead. Catherine is so drunk with love that Thomas becomes the center of her world very quickly. She abandons her studies, disregards her parents rules and worst of all, excuses Thomas' erratic behavior. As he falls deeper into manic episodes and substance abuse, Catherine falls along with him. Written in alternating narratives, we see the relationship develop from their first meeting and see how Catherine reflects on things many years later to their daughter. It would be easy to hate Thomas for his bad deeds and poor decision making, but the Leavitt's did an excellent job humanizing him. That isn't to say I liked him per say, but it was clear he was damaged from events in his childhood and had a mental illness so I could understand why (on some level) he behaved as he did. Overall, this was a very good book. It was a little heavy handed at times referring to how Catherine misread his intentions as loving instead of manipulative, but I will definitely read another book by this writing team.